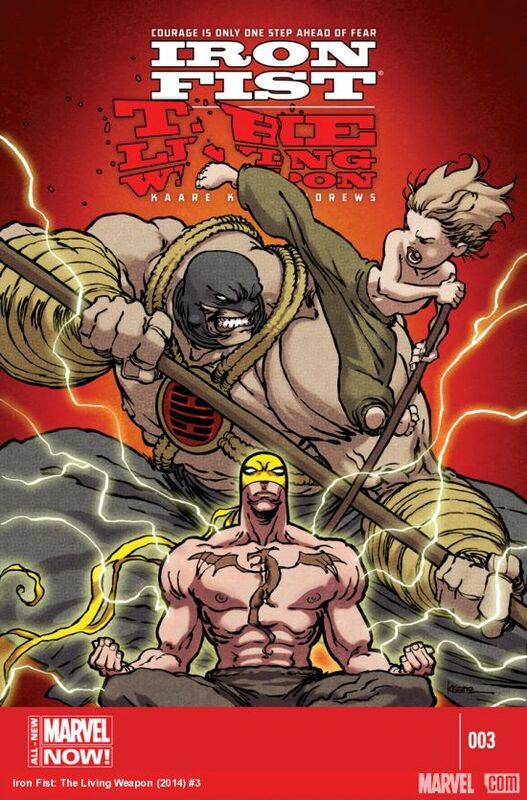 Danny Rand is back in a 12 issue maxi-series titled Iron Fist: The Living Weapon. Let’s cut right to the chase and take a look at just what makes this series so good. 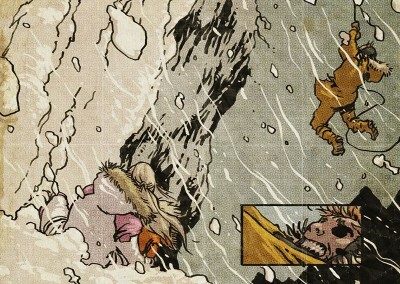 Writer and artist Kaare Andrews has taken Danny Rand and made him into a broken wreck. He’s a shell of a man who prefers violence to human contact. Haunted by his parents death, and the destruction of K’un-Lun, Rand had been broken down into a shell of his former self. 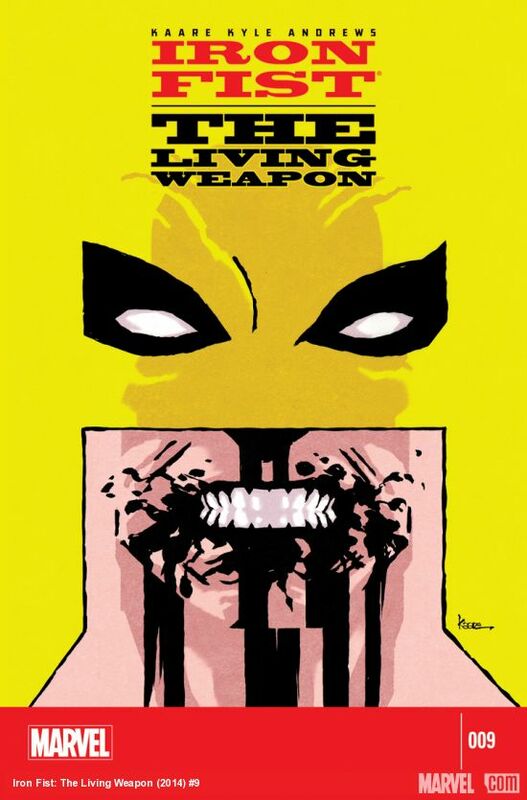 This could have backfired into another one of those cliche stories, but fortunately, Andrews has done a spectacular job with the tone and mood of the book that the Iron Fist manages to be not just interesting, but a dark horse contender for book of the year. 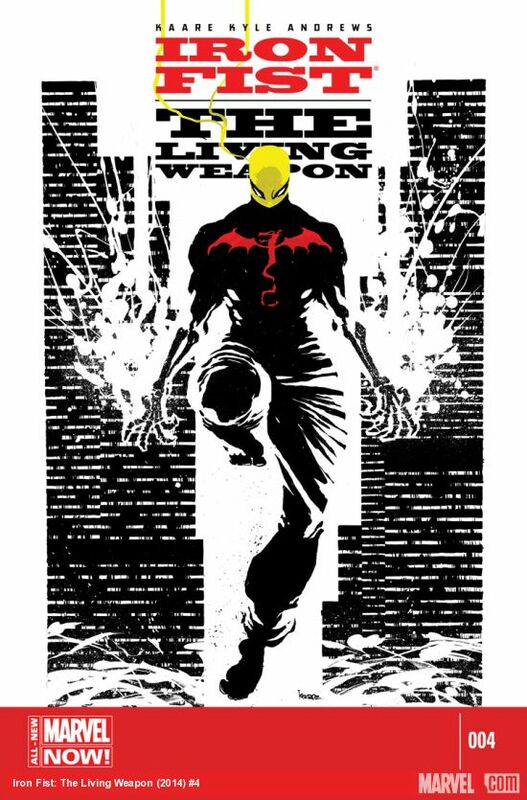 The story side of Iron Fist: The Living Weapon is nothing new. It’s not a re-telling of Rand’s origins, they haven’t created a new story. 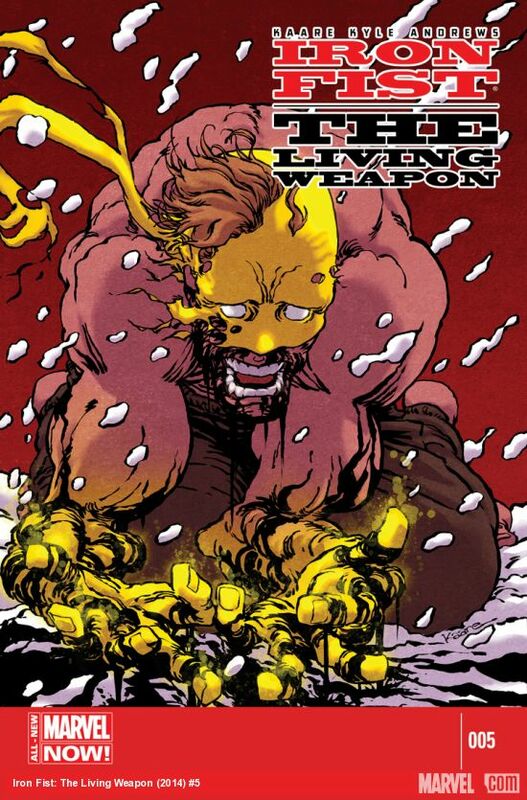 Instead it’s an intensive look into Rand’s origin as the Iron Fist and how sometimes life isn’t as easy as one makes it look. He maybe not be reinventing the wheel, but he’s certainly spinning the wheel for all it’s worth. 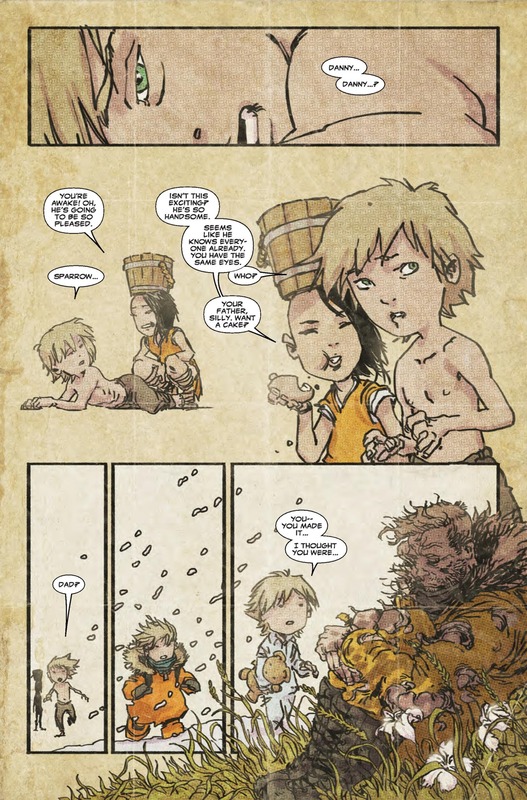 In the end this results in a fun book that tells a great story and takes a look at a young Danny Rand’s trials and tribulations in K’un-Lun. Right from the start Andrews thrusts Rand into a situation that can only get worse before it gets better. With his fragile mental state, Rand is overcome by an attack on him that leave him near death, and also leaves a mysteries little girl at his doorstep with something very valuable. 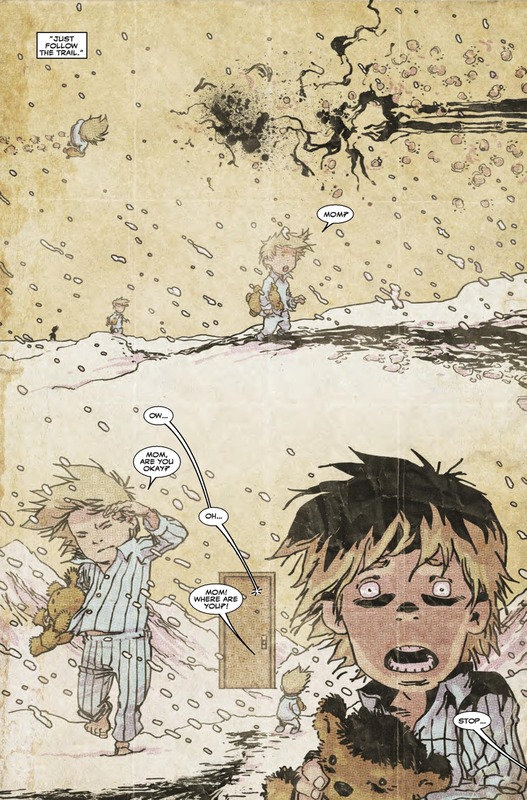 Andrews jumps back in forth between Rand’s childhood and his adult life, giving glimpses of what made him into the man he is today, this is consistent throughout the series. We jump to a time when Rand losses his mother and father, the trauma it causes the young man. His reluctance to learn the ways of K’un-Lun, and how it’s literally beaten into him. 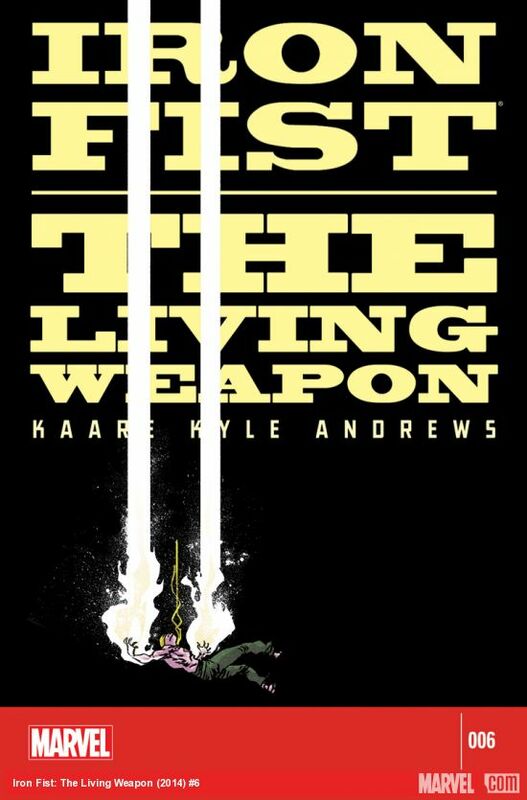 Andrews gives the reader plenty to savor in the first issue of Iron Fist: The Living Weapon, while cracking open the mystery of Rand’s past once again. He’s dissecting the deaths of Rand’s parents and how it breathed life into the new Rand, the one that becomes the Iron Fist. The antagonist in this is Brenda, a reporter interviewing Rand. She’s getting a little more than she bargained for, but I suppose when you hope into bed with someone you often do. It’s nice to see a story that deals with the emotional impact death, and the birth of life from that death, has on someones psyche. 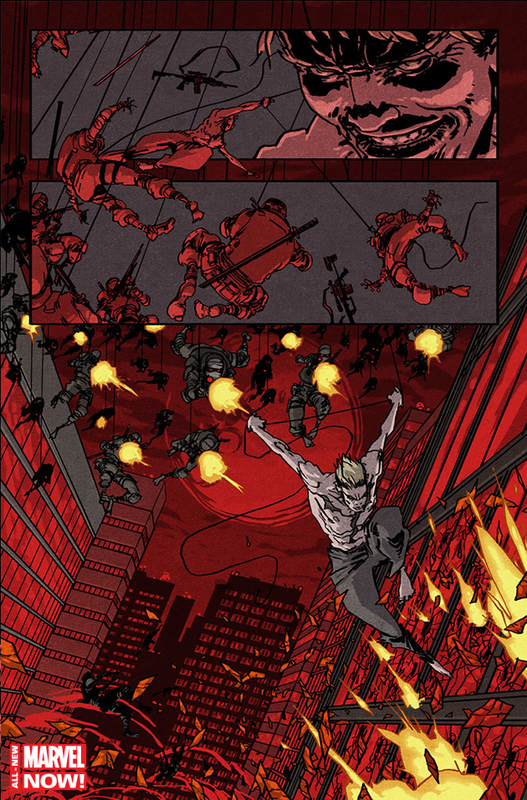 The story continues to delve into Danny Rand’s psyche as the issues progress. Jump forward a bit to the fourth issue and Brenda triggers some memories that may actually be a threat of things to come. The memories also give a peak into Rand’s mind and a glimpse to the terrors that lurk there. Danny’s thoughts betray him, they cause massive fits of guilt, and at the end of the day they leave him in a vulnerable state. Something that he can’t afford with the attack on K’un-Lun happening, leaving it in tatters. Andrews looks into Rand’s confrontation of his family’s past, but we also spend a significant amount of time steeped in Rand’s own personal history. The relationship between Rand and Brenda is also further explored, and it’s clear that the two have an exceptionally hot and cold relationship. Their relationship highlights Rand’s loneliness and his attempt to attain closure when it comes to his family’s demise. 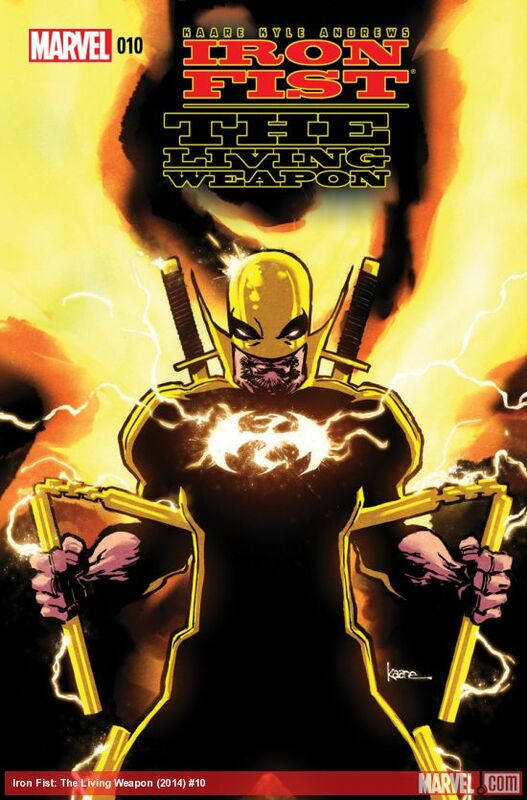 The end result is less about Iron Fist as a weapon and more about Danny Rand struggling to be a person. This is what makes the story so special. It’s about Rand’s inner travels, how he has become the flawed man that he is, and what he needs to do to right the course. The become the super-hero he trained for. It’s a personal journey for Rand, one that is fraught with danger. One that ensures that one wrong step could lead to a steep fall. He’s repeatedly kicked in the gut emotionally, mentally, and physically. There are shreds of hope and we can see Rand coming out of this. All isn’t lost thought. We see that Rand has decided to rebuild the destroyed Rand building. Something that had been standing as a reminder of what happened to his family. He’s taken the step of moving forward and building something new. Maybe this will also cross-over into his personal life and how he handles that. Daniel Rand, the son of wealthy businessman Wendell Rand and his second wife Heather Duncan, was nine years old when his parents, along with Rand’s business partner Harold Meachum, brought him on an expedition to the Himalayas to find the mystical city of K’un-Lun, said to appear once a decade. Betrayed by Meachum, Wendell Rand fell from a mountain ledge to his death, leaving Heather and Daniel along clinging for survival. Shortly afterward, Heather sacrificed her life to protect Daniel from a wolf pack, and her spirit ascended to Feng-Tu. 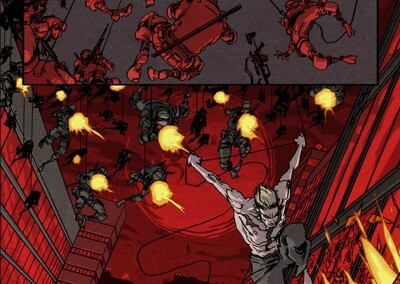 The denizens of K’un-Lun found Daniel and took him in, while a frostbite-crippled Meachum learned of Daniel’s survival and spent the next decade preparing elaborate defenses against future attack. 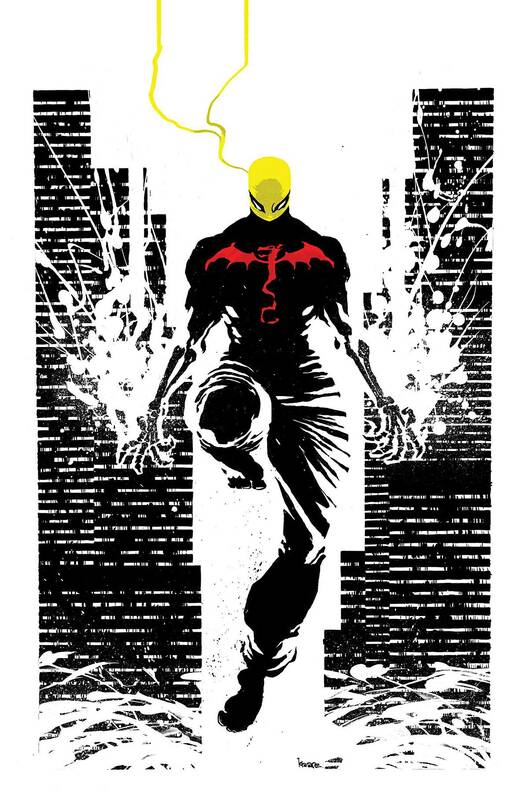 To learn more about Danny Rand, and Iron Fist, check out our Character Spotlight on Iron Fist. You can read it by clicking here! 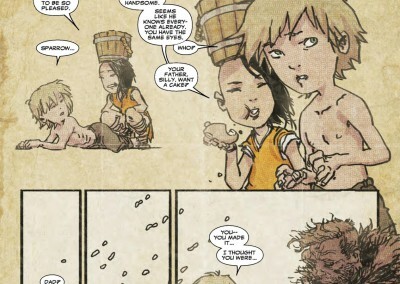 The story progresses even further with the introduction of Pei, the young girl previously mentioned from K’un-Lun. She adds that sense of kung-fu magic because nearly all scenes involved with her contain a lot of action. 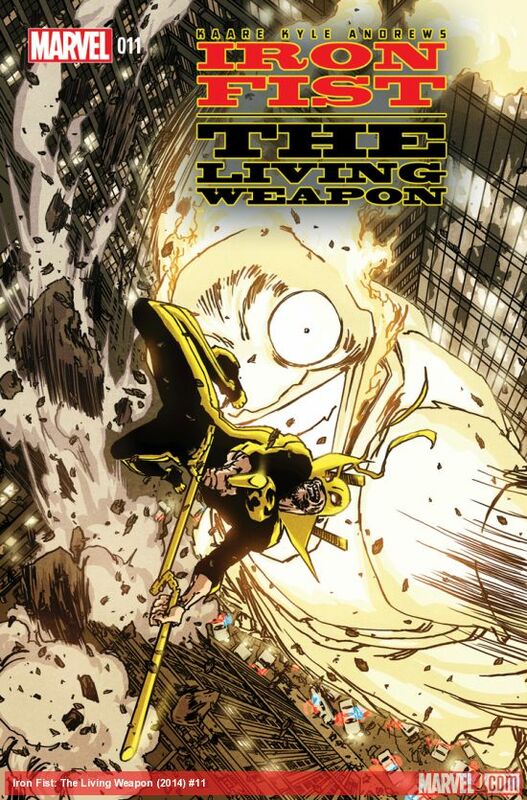 Whether it’s from the people chasing her and trying to claim the mystical egg she holds (hint, when it breaks out comes someone very familiar to the Iron Fist), or her interaction with Brenda. Pei is never one to find her self relaxing, she’s always on the run. Around issue five or so there’s a plot development that feels a bit perplexing. How does Brenda all of a sudden have kung-fu skills? She seemed helpless in the first few issues, but by now she’s able to hold her own. Now don’t get me wrong, I like her like this, but it completely feels like it’s out of left field. To be fair though, we’re only half way through the series, so it’s something that could be explained in future issues. 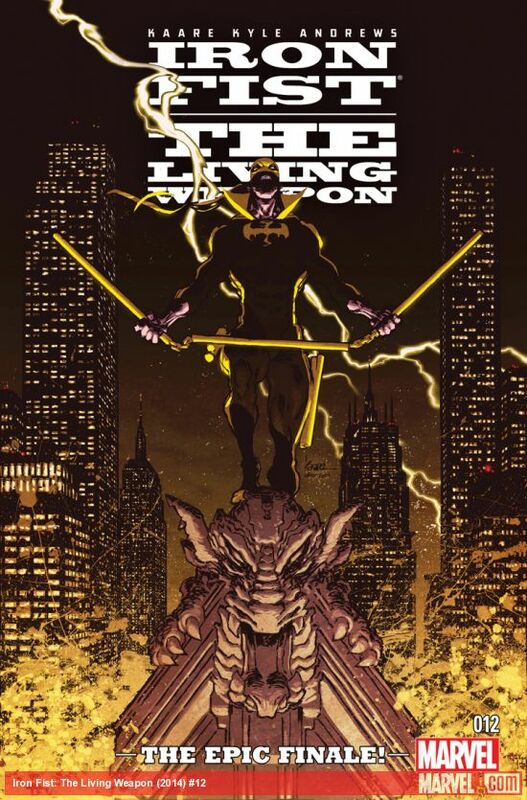 As we move on to the final issue of the first volume things are looking pretty grim for Danny Rand, and even Pei and her newly hatched dragon who are taken captive. We also see that a previously thought victim of Davos has survived his attack and is ready to help Rand any way she ca. Her losses are just as great as Danny’s, perhaps greater, yet she holds fiercely onto life, even engaging in a bit of foreplay to prove just how strong her will to live remains. It’s all to remind Danny that he’s already been on the brink of death, and we all know how that turned out. More importantly, he once again gets an opportunity to choose between life and death, and to choose life this time around. If he succeeds, he’ll also get the chance to bring new life to others. There are the remnants of K’un-Lun to think of, and its draconic protector. His company is a ghostly shell just waiting for new money and blood to flow in. He can choose a new mission for his Iron Fist to work on, one that’s not purely about vengeance. For now though, there’s still a lot of vengeance that needs to be dealt, something I’m sure will show up in the upcoming issues. Now that I’ve discussed the story, and how spectacular it is, it’s time to delve into the art. Andrews has pulled double duty here and it’s not showing and signs of detriment. He delivers some of his best work to date. The book has a unique look to it. Every page feels like a work of art, perfectly designed to tell the story of that moment, that scene. From the worn-paper effects used for flashback pages of Rand’s childhood to the powerful red backgrounds throughout the scenes with Danny and Brenda, it’s great seeing the stylistic approach taken to each timeline in the story. 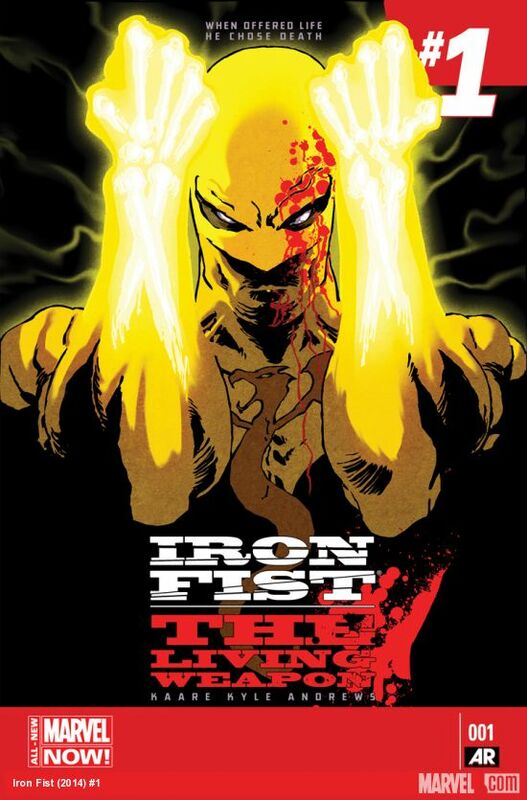 When the present day portion of the story hits, Andrews adds a little more saturation to the characters on page and puts atmospheric tones into the backgrounds as Iron Fist confronts his tormentor in K’un Lun. 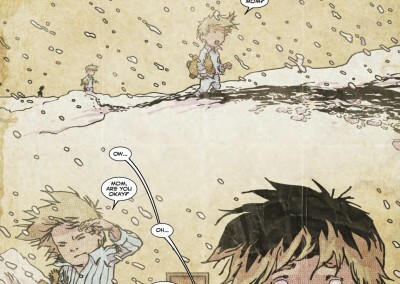 It’s easy to wash the pages white under the pretense of snow, but instead Andrews depicts the howling, snowy winds with flakes and clumps of snow obstructing the view, but also adding to the scenery. He doesn’t take any of the line work lightly, giving every character and each prop weight and depth. Throughout the story, however, Andrews plays with that style, pulling back and minimizing lines, like when Danny wakes in the night and ponders the choice of choosing. Here, the artist uses minimal lines and no color to create a stunningly detailed figure flipping and kicking through five panels on the lower half of a page. 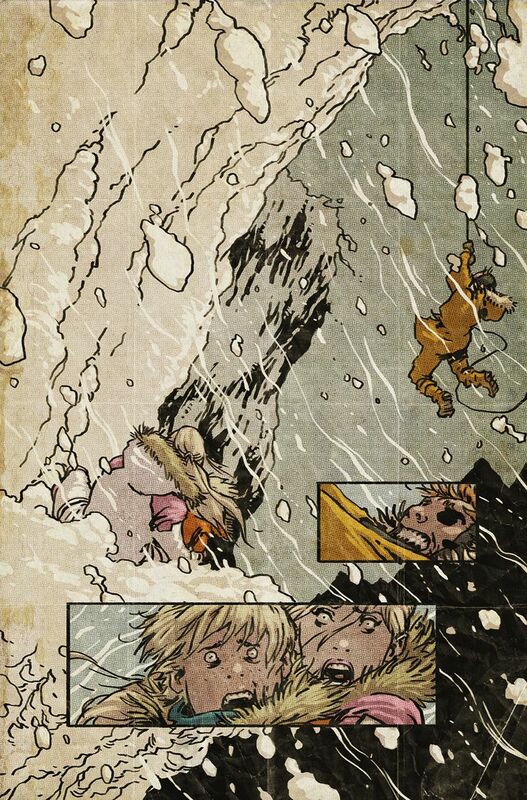 It’s the stunning art that really enhances the already wonderful storytelling. This is truly the case of the art perfectly complimenting the story. 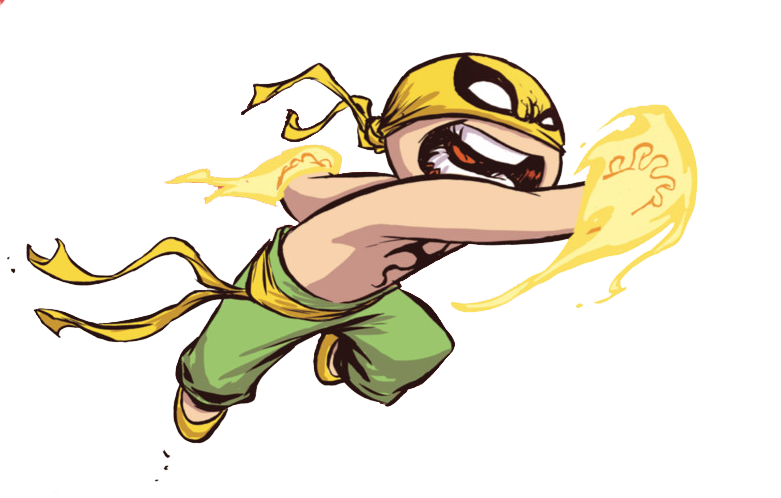 I admit, I’m only familiar with the Iron Fist from the various New Avengers stories he’s been in, and some other team-up titles. I never read one of his series before, but Andrews managed to captivate me with a story I was vaguely familiar with. It felt new and fresh and he made me feel sorry for Danny Rand. 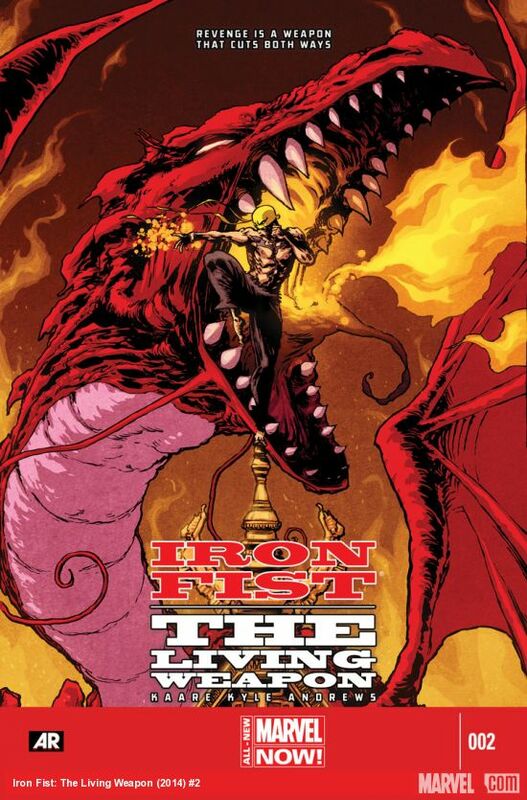 Fans of Iron Fist will love what’s been done here, a re-telling of a story without really re-telling it. Just expounding on it. Newcomers will be welcomed into a new story with some fantastic writing and art. 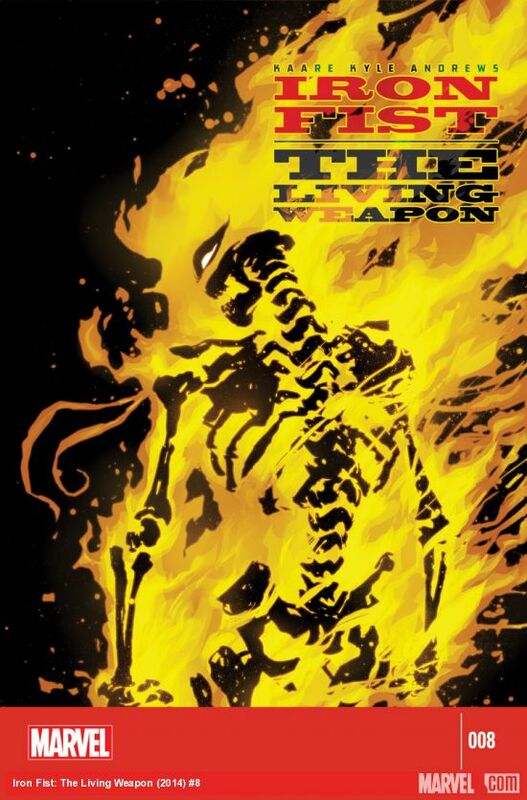 Iron Fist: The Living Weapon came in with little fanfare, but it’s made a huge impact with me. This is undeniably one of the best stories published this year. I can’t wait to see with the second half of the story brings. Single issue are still available for purchase at various comic shops and other retailers. 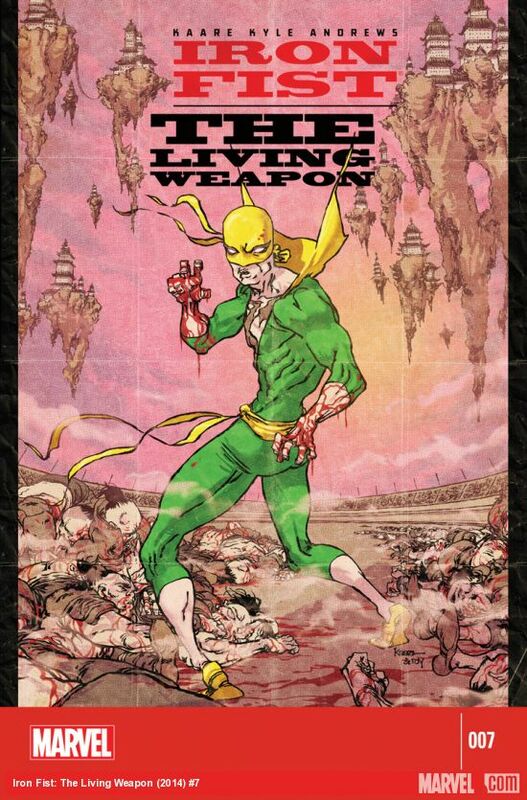 Marvel will be releasing Iron Fist: The Living Weapon Volume 1 this December. I’d highly recommend you get your hands on it whatever way you can.